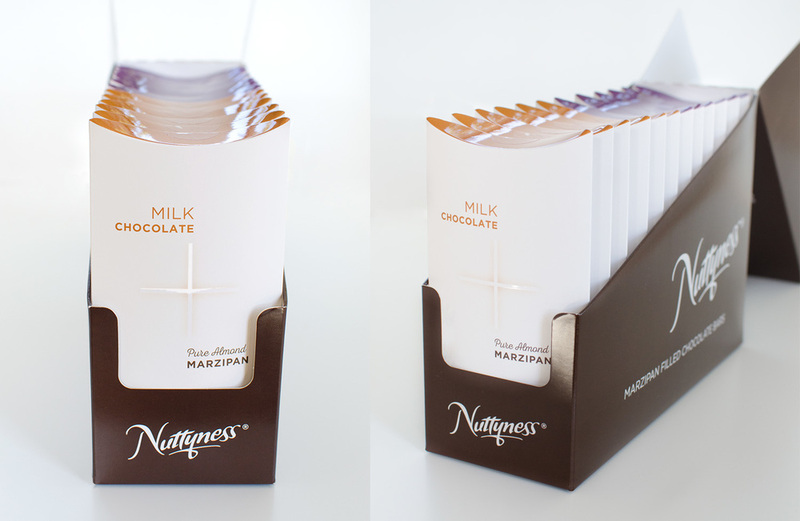 Nuttyness produces chocolate-covered "marzipan with a twist" - and asked Rena B Design to develop packaging for a new product: marzipan-filled bars of chocolate. We wanted this new product to really stand out from regular bars of chocolate, keep the clean, modern look but elevate it appropriately for a more high-end product. The result: a custom pillow pack, with matte/gloss finish that highlights the "Plus" you get with your chocolate. A custom retail display case was also designed to show off the product on the shelf and protect it during shipping.